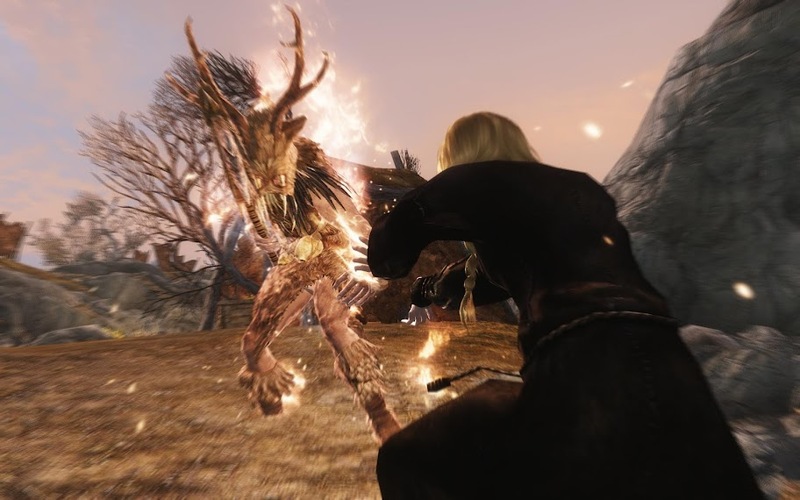 When I had just gotten Skyrim, I asked advice on which type to play in Skyrim, and of course I got mixed answers, most favouring either the hunter or the mage type. I've played until level 20 on Ravereth the hunter since, but today I've been a bad girl, felt the itch and succumbed to mage. Now I play Ravanel, I notice how much I've missed roasting things (as demonstrated on the picture above)! I also like learning new spells, and discovering new tricks. The mage feels a bit more versatile than hunter, as I keep mixing different spells, while as a hunter you... well... just keep shooting arrows at things. I also was getting a bit tired of having Lyria running after me all the time. I've build Ravanel with a bit more health than Ravereth and she should be able to survive on her own. Theoretically. Eventually I'll want to try out other playstyles, such as that of my two-handed warrior, as well. I'm not sure yet which character I will stick to in the end. Perhaps I will hopelessly keep switching between them all the time! Ravereth discovered a cave called Darkwater Pass and took a peek inside. It was very dark, but there was a lot of water, and I could hear the splashing of fish. All of a sudden, she was found by a strange goblin-like creature (of which I later learned it was called a Falmer) that attacked her. It was relatively though to fight, but she managed in the end. When she looked on his body, she found a freshly caught fish. He had been sitting at the edge of the water in that cave, catching fish. A Gollum reference? Either way, the cave freaked her out, so she quickly returned to the outside world and continued her travels. Ravanel had to pass a certain region in the mountains, wherein she got harassed by two sabre-toothed tigers. They're such a pain! There was no way she could get past them while sneaking. She also couldn't kite them, as they leapt from the shadows right on top of her, and run very fast. On top of that, it was night and she couldn't see them well at all. I nearly got a heart attack each time they killed poor Ravanel. So she gave up and spent the night at a bedroll in some nearby camp, and dreaded the next day to come. However, she found them both dead the next day by the hand of an old orc. She didn't tell him, but you can imagine her relief! The orc asked me if she please could kill him in a duel (for some weird orcish reason he wanted to die), but considering his recent victorious involvement with the sabres, I passed. Ravanel usually runs around in her gothic necromancer's robes, but carries some light armour with her as well, for the rare cases when she's not allowed to use magic (for instance in bar brawls - oh yeah, I'm totally into those!). Today she looted some new light armour that had a much higher armour rating than her previous. I was a bit baffled when she put it on, though. How exactly does this protect me? If I encounter an enemy, will it be... 'distracted' by my looks or something?! I hope you enjoyed these stories. Have you had similar adventures as well? Or am I the only one who experiences Skyrim like this? Lol! That does look very protective... versus being completely naked. I have to agree! It protects almost half your body from small temperature drops. Also it may have pockets where you can store small items. I do hope it's cruelty free synthetic fur though! This makes me want to boot up Skyrim again. I put hundreds of hours into the other TES games, but not this one (due to LotRO). Haha, great comic! If you got a period of a bit less LotRO, I'd definitely recommend Skyrim - it's the best of all TES games in my opinion. Heh. I had the opposite problem. I was almost finishing everything I wanted to do with my mage when I started to get bored with him and getting urges to just go back to melee. So I remade my thief/assassin and have been happily backstabbing/sniping people! Sort of. I have been having some weird issues that I am not sure it is due to the way I mix mods like a mad scientists or something else. They are minor things but they irritate me. 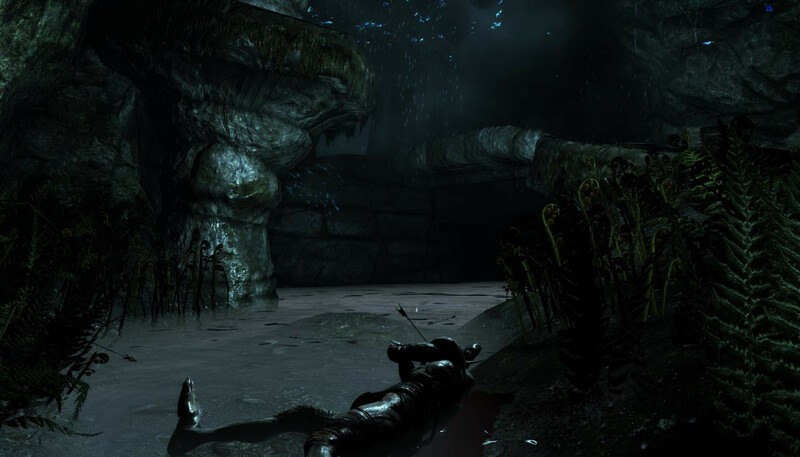 About the Falmor, my first encounter with them was when I found a cave I decided to explore with my warrior. I think he was still pretty low level then and had a tough time fighting one or two of the bastards. The cave seemed to go pretty deep and there were more Falmor there. So I decided it was best to retreat and come back later when I was stronger. I don't think I ever did that but since then I met a lot more falmor, learned where more or less to expect them and to hate those little buggers! Other interesting encounters I had in the road were an argonian selling skooma, some hired dark brotherhood trying to kill me and my thief/assassin getting a hired thug trying to teach her a "lesson" because she pissed somebody off. If you are looking for some light armor that actually protects vital organs, I think the glass armor is the second best set and should be better than that one. Only problem is finding them either as loot or for sale in the NPCs. The best set would be the dragonhide set but you need to have smithing 100 and the perks for it. As a mage the perks would probably be better spent on the magic schools. The elven set might be better too but not sure. 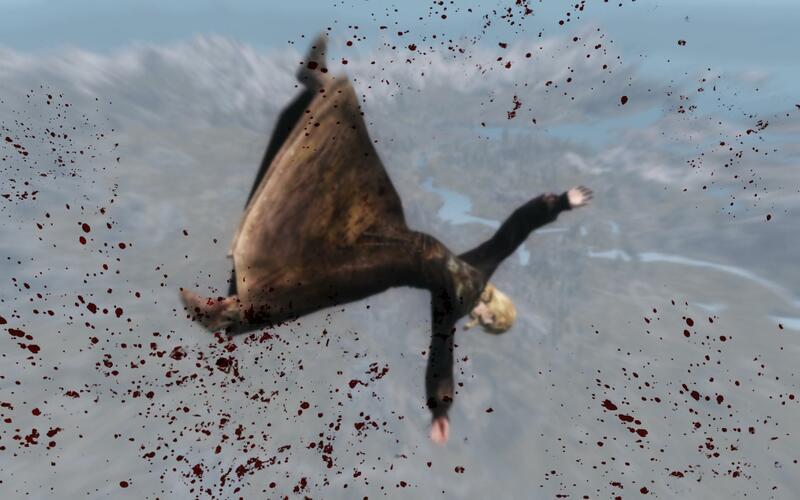 It is considerably easy to get though if you don't mind killing some Thalmor. I love how you can write comments that could almost be a post of themselves. Just wow! If I recall correctly, the orc wanted to die because orcs want to die in the bloom of their lie in a battle - they never want to become old... strange creatures, those orcs. On my mage, I mostly use enchanted robes, dresses etc. On my hunter I wear the elven armour at the moment. Found it on some wandering thief. Will swap to the better glass armour as soon as I find it somewhere. Not sure if I want to invest that much in crafting now there's still so much to improve in marksmanship. Wow, I'm really impressed by you finishing the main story arc at level 25! I always get really distracted by side-quests myself. Even on my mage, on which I tried to go for the main story the most - she is level 22 and still in Riften (I don't really know how far in the story that is - no, don't tell me!). And yes, I love the sneaking as well! So you're into Guild Wars then? What happened to your kinship application in LotRO? Or are you taking a break from that game?